Our company is well renowned for manufacturing & supplying pigment pastes that cater to diverse requirements of plastic, textile, and paper industries. Further, our Fine Pastes are widely accepted in Paint industries for their superior quality, fine dispersion & high fastness properties. Color YELLOW, ORANGE, RED, BLUE, GREEN, BLACK, ETC. 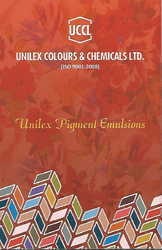 Unilex pigment fine pastes are fine dispersions of organic pigments in aqueous medium. Preparations are binder free, easily pourable and contain non-ionic and anionic wetting and dispersing agents. They are miscible with each other in any ratio and can be blended with one another in suitable proportions to get desired shades. Unilex pigment preparations are readily miscible with any aqueous base paint systems. Their main use is for coloration of synthetic emulsion paints, latex, wood stains, etc. Highly concentrated, hydrophilic, easily pourable pigment paste mix readily with aqueous medium to form stable dispersions. R = 2% in a reduced shade emulsion paint containing 20% TiO2 Rutile. Unilex pigment emulsions for printing and dyeing applications is extremely suitable and well known for colour brilliancy at all depths and high degree of fastness properties. Unilex pigment emulsions consist of finest varieties of organic pigments that have optimum particle size with desired particle size distribution. Unilex pigment emulsions have very good stability even after many years. These Unilex Emulsions are miscible with one another so as to obtain any desired combination shade. They give good colour strength and bright shades even when used at lower depths. Unilex pigment emulsions are suitable with most of the present day textile binders and perform extremely well in self-emulsifiable binder systems using water as well as solvent based synthetically thickened binder systems.